Pfc. George Grizzle was a machine gunner in the 112th Regiment of the 28th Division. He had been sent to the unit in late July as a replacement. When he and the remaining 9 survivors of the Nov 2-7 assault were captured, he was the second most senior man. He spent 6 months at Neubrandenburg & Dannenwalde POW camps. He was interviewed by his daughter recently about his memories of that time. Q. What would you like to tell about the battle? A. I don't think I have too much to add... We took the place of the 9th Division a couple of days before. The weather didn't clear enough for air support, so it was decided to go ahead without it on the 2nd. After clearing a few mines, we really didn't encounter much resistance. The trouble came when we were deployed on the edge of the ridge (in the town of Vossenack) and subjected to constant bombardment for five days. We were way under strength, and the mental casualties began to be a big factor. The higher levels of command couldn't understand why the division was so under strength. Q. What do you attribute it to? A. 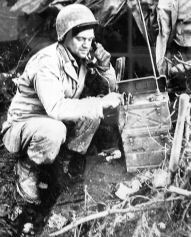 There had been blunders-- failure to follow orders and plans, communication failures-- way back to Normandy. One time then we were supposed to take a hill at 1430 hours. We got there at 1400 and were able to take it without any real trouble. However, artillery support had been ordered for 1430. The Captain said it wasn't necessary now, so we would call it off. The message didn't reach its intended recipients, because the barrage rained downed on us at 1430. I remember the Captain yelling at the radio man to get them on the radio and stop it. But they must have laid the radio down for the entire time, because it continued for the planned "time on target". I believe we lost 14 men. Another time that comes to mind was in the planning of the Siegfried Line offensive when we were sent in unfortified jeeps to an area six miles or so inside the line. I was in the second jeep. The first one got by, but then they discovered us, and our jeep was hit. The three men riding in it with me were all casualties. They could have used an array of more heavily armored vehicles, which were certainly available. I was captured on November 7 along with many others and put on railroad cars for about 10 days or so and taken to Stalag IIA at Neubrandenburg. They took 160 to 180 of us to another camp in an isolated storage area in a wooded place at Dannenwald where there were concrete storage buildings camouflaged and brush growing on top of them. We mainly spent our time here making roads with picks and shovels, working 10 hours a day, seven days a week. In about six weeks (shortly before Christmas) we started receiving Red Cross rations and about every two weeks thereafter. Prior to receiving these ration we had boiled vegetables such a rutabagas, potatoes and cabbage. Some time after that we were moved out of Dannenwald back to the town of Neubrandenburg- about February 1. They had us building a concrete wall on the south side of the town to defend it from the Russians. The last we saw of it it was about 200 yards long-- never finished. They had not taken the forms off when we left there (thank goodness as we had intentionally not put any cement in the concrete mixture and it would have just crumbled). One evening after this we were taken out and marched toward the Western Front. This was the last we saw of Neubrandenburg. It took 4 days or so to get to the Western Front. We arrived there a couple of days after Hitler had killed himself. The war continued and a couple of days later the Russians came in and took Berlin. The road to the Western Front had been filled with everything and everybody, on foot as there was no gasoline for motor vehicles-- baby buggies, carts, etc. We had left Neubrandenburg in the evening as the Russians were getting very close, traveling the 100 miles or so on foot, resting at night whenever possible, and eating what Red Cross food we had left. Eventually I was separated from anyone I knew. One night towards the end of this trek, I slept in haystack (along with several others unknown to be there until all emerged the next morning). 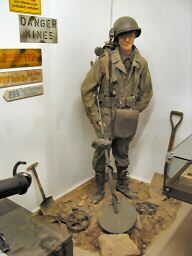 I had only travelled a half mile or so when I met up with an American staff sergeant who was having all the Germans disarm and pile their weapons along the side of the road, a pile approximately 3 feet high by 20 to 30 yards long. We continued on up a hill and had breakfast at a camp kitchen and were then taken on a truck to a collection point for POW's at Schwerin Air Corps Camp. There was a long row of brick two-story barracks there where we were housed until a large number of us were collected and then a convoy of trucks came and took us across the Elbe River (actually the front line). I don't really know where the convoy took us, possibly a university where there was an airport. They then loaded us 26 men to a plane, and took us to Nancy, France. We actually arrived there the day the Armistice was signed. From there we were taken to a little French army camp located at Epinal, and stayed there a week or ten days until they had room for us on the west edge of France at LeHavre where there was a tent city set up called Camp Lucky Strike. A ship came in there, and we boarded for home. I do not know the date we left Le Havre on the boat, the name of the boat, or the date we arrived in the U.S. We came into New York harbor near the Statue of Liberty, unloaded onto trucks and were taken to Camp Kilmer, New Jersey. After that almost immediately I got on a train for Fort Sheridan, Illinois, then on a train home where I spent a 60 day leave, and was sent to Camp Beale, California for discharge from the army. Submitted by his daughter, Marsha Batscha.